Ibro Haulage Ltd is a sub-contract haulier for Tarmac, the company was formed in 2017 by Ibrahim Dino. 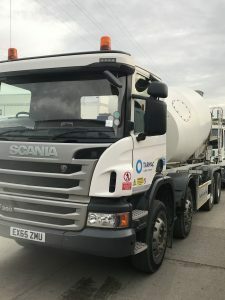 They transport concrete delivering to various construction sites all over the London region. Director and driver Ibrahim Dino continually observes the FORS standard when reviewing and making decisions for the business. FORS has helped the company become a more compliant operator helping to be safety conscientious. I was able to achieve our first FORS bronze accreditation with ease, thanks to the guidance provided by FORS. After achieving our bronze accreditation, we were encouraged to aim for a FORS silver accreditation, after seeing the noticeable improvements within the company after implementing the processes required for a bronze accreditation. After becoming Bronze and seeing the benefits FORS made available to me, especially the e-learning and fuel management, I decided to move forward and apply for Silver. I was awarded the Silver accreditation after this the only way is Gold. The e-learning modules are a constant form of training along with the toolbox talks on the FORS website improving my knowledge. The main reason for progression was that I wanted to demonstrate to Tarmac and their customers that i was capable of meeting the challenges ahead. It is important that we continue to improve the operations of the business and by doing this we are in a better position to benefit from more contracts and continued expansion in the future. I operate 1 vehicle so have do not need to recruit but if I did it would be by word of mouth and recommendations. We actively try to reduce any noise pollution we may make, we turn off vehicles if standing longer than 3 minutes in traffic, try to keep noise to a minimum when loading and unloading. We have researched alternative transport modes to include Hybrid and gas powered vehicles, when vehicles are bought to the market that enables us to use them for our workload, we will definitely look into the possibility, in the meantime we use Euro 6 vehicle. FORS has enabled the company to run more efficiently and aid drivers to improve their skills. Going forward for the future Ibro haulage ltd would use the advances in technology with truck and aids to help drivers in their daily tasks. Ibro haulage ltd is a proud silver member of FORS that will continue to evolve in setting higher standards with our business within the road transport industry. Obtaining our Gold accreditation will continue to add value and raise the status of the business. At the present time we are not using Social Media as our work is directly franchised to with Tarmac, so we do not have the need to advertise our company for work, but feel in the future it is something we will look to using to show our achievements as a company.